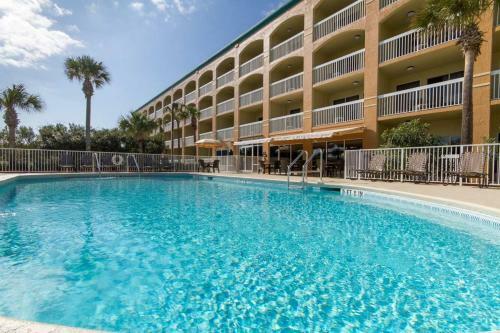 Nestled on Anastasia Island directly on Saint Augustine Beach, this convenient hotel offers comfortable guestrooms and enjoyable facilities just east of the historic city of Saint Augustine. Hampton Inn Saint Augustine Beach provides convenient access to several of the area's oldest landmarks. Explore Ponce de Leon's Fountain of Youth Park or discover 170 species of birds at Anastasia State Recreation Area. Take a horse-drawn carriage and enjoy colonial architecture as well as a variety boutiques, restaurants and pubs. Guestrooms at the Saint Augustine Beach Hampton Inn feature amenities such as refrigerators, microwaves and free high-speed internet access. Work out in the fully equipped fitness room or go for a swim in the pool. Upon check-in photo identification and credit card is required. All special requests are subject to availability upon check-in. Special requests cannot be guaranteed and may incur additional charges. Please note that exterior renovations are taking place from 2017 May 23 until 2017 December 31. Guests may experience minor disturbances. Guests are required to show a photo identification and credit card upon check-in. Please note that all Special Requests are subject to availability and additional charges may apply. the hotel Hampton Inn Saint Augustine Beach so we can give you detailed rates for the rooms in the desired period.